Hi all, long time no update, i know… But i’m not the one who can write every day a new article. This time i have to post about a bug fix, which is a bit disagreeable – but it happened. While releasing the latest update which fixed some old issues, a new line in a CSS file was left there, which caused the manual flipping to fail every time you drag the page. If you run into this issue, please use one of the methods above. 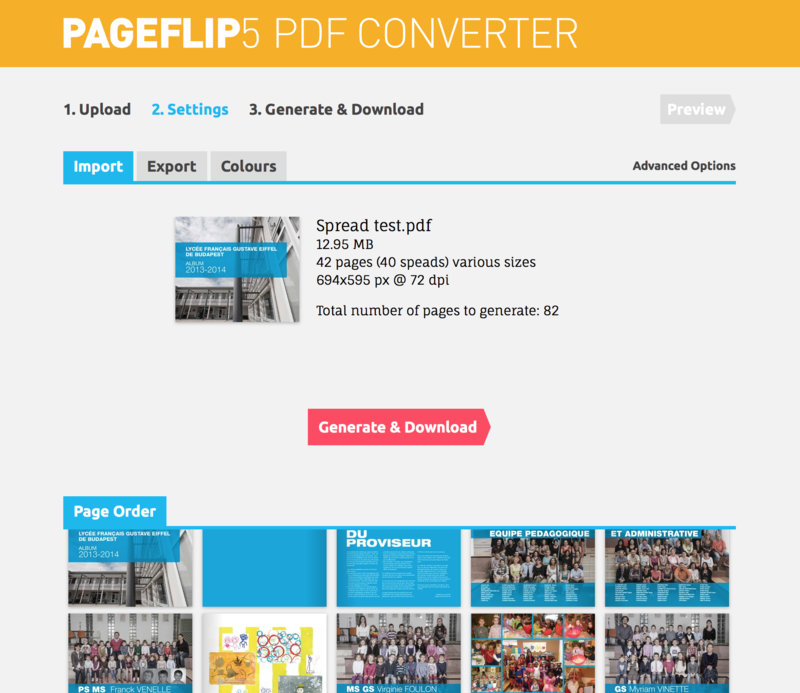 I proudly announce the second version of the PDF to Pageflip 5 converter, which is an almost new app with custom PDF parser for page info and link retrieval, new rendering engine and some helpful new features. Making the PDF parser was a great experience, and give an easy way to get real page number, page sizes, and links from the PDF. It is compact, fast, and yet 99% compatible. Thanks to it, all Links are retrieved from the PDF and transferred to the Pageflip book, both page and URL links. The converter automatically recognize spreads and rotated pages (based on first page size), and split or rotate them, but with the new import options, you can now set manually how spreads, rotated pages, or pages with different sizes are handled. The new rendering engine (not talking about ImageMagick, which makes the raw PDF to image conversion) is optimized for background processing, and can run on multiple cores, so this way we can achieve up to 4x speedup for the conversion time. The PDF converter will be soon available as Licensed Application you can install on your own server, and do conversion on your own, using the same tool, but at the maximum speed, which depends on your server’s resources . The PDF converter will also be available as API with subscription type access. With the API version, you can convert PDF from your own website, calling a simple php script with a set of POST variables, the conversion will instantly start, and as it is ready you can download the zipped package. Progress checking included. The last week, the Pageflip PDF Converter app was moved to a new dedicated server. Conversion are now made 2 to 10 times faster then before. Yeah! I’m also working on the converter’s engine, so the converted Pageflip books will soon includes all the page and URL links from the original PDF. As part of this improvement, i wrote a custom PDF parser script from scratches. This script retrieve many informations from large PDFs in less than a second, which will improve the performance of the converter. All of these new features will be added the converter, which will result in a slightly different new version. As the PDF file format gives a lot of freedom for PDF generating applications, it was a great challenge retrieve the all the needed informations from many different PDF, but despit the huge number of testing, there should be issues with some third party generated PDFs, so the converter will still abeta version. For this reason, i added a smart logging system, so if your PDF is not parsed correctly, You just need to send me an e-mail, and i will be able to fix the script using you PDF’s data-structure (without and content data, keeping your privacy safe). And one mere thing: the PDF converter will then packaged to a purchasable product, you can install on your server, and use them from your browser, just like the current version, except that it will run on your own server. Please note, that running the converter needs a server with lot of processing power, with Imagemagick installed on it. There’s now a “Download key.js file” button, which let you download a configured key.js file, then you need to overwrite your original file with it, and it’s ready. This way, you don’t need to open/edit/save the file.